The terrestrial biosphere is an integral component of the global carbon cycle. Carbon is brought into the terrestrial biosphere through photosynthesis, and it is released back to the atmosphere through plant respiration, microbial respiration (or "decomposition"), fires, and some human land use practices. 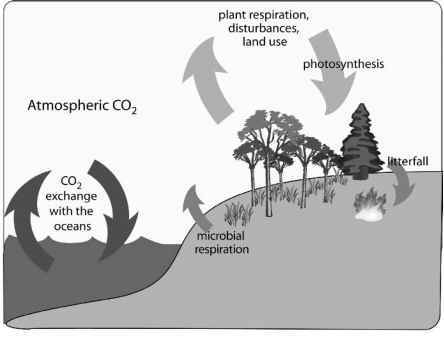 At times when photosynthesis exceeds the sum of plant respiration, microbial respiration, fires, and land use releases, there is a net sink of carbon from the atmosphere into ecosystems. When photosynthesis is less than the sum of the other terms, there is a net source from ecosystems to the atmosphere. On seasonal timescales, the gain and loss of carbon in terrestrial ecosystems is evident from subtle changes in atmospheric CO2 concentrations—the seasonal "wiggles" in the Mauna Loa curve are a famous example of this phenomenon. But it is on longer timescales, from decades to centuries, that the carbon cycle of the terrestrial biosphere can significantly affect the CO2 levels in the atmosphere and become important to the climate system. On these longer timescales, the amount of carbon stored in the terrestrial biosphere is the result of the balance between net primary productivity (NPP, the net accumulation of carbon through photosynthesis minus plant respiration over a year) and carbon losses through decomposition, land use, fires, and other disturbances (Figure 14.1). The scientific community currently believes that the terrestrial biosphere has been acting, on average, as a net sink of atmospheric carbon. In fact, terrestrial ecosystems appear to be absorbing a significant fraction of anthropogenic CO2 emissions (from fossil-fuel combustion and, to a lesser extent, cement production) during the past few decades—thereby keeping atmospheric CO2 levels lower than they would otherwise be. Figure 14.1. Relationships between terrestrial, oceanic, and atmospheric carbon pools. Adapted from Foley et al. (2003). The terrestrial biosphere, in effect, has been "subsidizing" part of our fossil-fuel emissions—keeping a significant part of these CO2 emissions out of the atmosphere. Some basic numbers illustrate the point. During the decade of the 1990s, human activities were releasing roughly 6 petagrams of carbon per year (PgC y-1) from fossil-fuel combustion and cement production (Prentice et al. 2001). During the same time period, humans may have been releasing another 1 —2 PgC y-1 through land use practices, primarily tropical deforestation (Houghton 2000). Taken together, these fossil-fuel and land use carbon emissions should lead to a 7—8 Pg increase in the carbon content of the atmosphere every year. Observations of atmospheric CO2 levels, however, show that only about half of this anthropogenic carbon is accumulating in the atmosphere— the so-called airborne fraction. The other half of the anthropogenic carbon emissions is, for the time being, apparently absorbed in the oceans and terrestrial biosphere (Bousquet et al. 2000; Prentice et al. 2001; Schimel et al. 2001). Note: Units are in PgC (1015g of carbon) per year. 3 billion tons of anthropogenic carbon emissions per year—and we can begin to estimate the approximate breakdown between oceanic and terrestrial uptake. For example, in the third assessment report of the Intergovernmental Panel on Climate Change (IPCC), Prentice et al. reported that the terrestrial biosphere absorbed roughly 1.4 PgC y-1 (or about 22 percent of the anthropogenic emissions) during the 1990s and nearly 0.2 PgC y-1(or about 4 percent of the anthropogenic emissions) in the 1980s (Prentice et al. 2001; Table 14.1). But how certain are these estimates? Even if we can roughly estimate the uptake of CO2 by terrestrial ecosystems and the oceans, we do not know how these will change in the future. And as humans continue to pump more and more CO2 into the atmosphere, we need to remember that the terrestrial biosphere may not always continue to absorb such a large share of our emissions. What if the terrestrial biosphere stopped absorbing so much of our emissions? 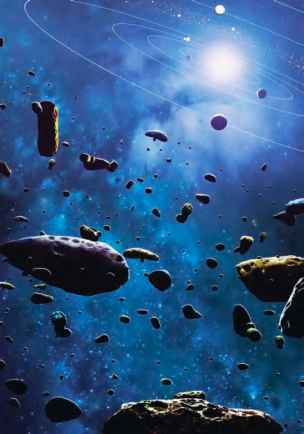 Or what if the terrestrial biosphere started to release carbon dioxide instead of absorbing it? To address these questions, we need to understand what controls the uptake of carbon in the terrestrial biosphere. How Well Can We Estimate the Size of the Terrestrial Sources and Sinks? In the IPCC third assessment report, Prentice et al. reported estimates of the net uptake of anthropogenic carbon emissions by the terrestrial biosphere: These estimates include the balance of all terrestrial carbon sources (from deforestation and other land use practices) and all terrestrial carbon sinks (the so-called residual terrestrial sink or missing sink). The estimates of net terrestrial carbon uptake show considerable changes in the past two decades: from -0.2 (±0.7) PgC y-1 during the 1980s to -1.4 (±0.7) PgC y-1 during the 1990s (with a negative sign indicating a sink, or carbon uptake on land; Prentice et al. 2001). These figures were largely estimated using two factors: (1) overall constraints on the global carbon budget (by subtracting the measured atmospheric increase from the total anthropogenic emissions, which are both thought to be reliable estimates, to give the combined uptake of the oceans and terrestrial biosphere); and (2) the breakdown of oceanic versus terrestrial carbon uptake as indicated through simultaneous measurements of CO2 and O2 in the atmosphere, measurements of 813C in the atmosphere, and the results of ocean carbon cycle models (see Appendix 14.1). Le Quere et al. (2003) recently updated the Prentice et al. estimates of oceanic and terrestrial carbon sinks and produce new figures for the net terrestrial carbon uptake during the 1980s (-0.3 ± 0.9 PgC y-1) and the 1990s (-1.2 ± 0.8 PgC y-1). To determine why there are such large differences in net terrestrial uptake between the 1980s and 1990s and how this may change in the future, we must break down this net uptake value into the different sources and sinks of atmospheric carbon within terrestrial ecosystems. Land use practices, such as tropical deforestation and continued agricultural production in temperate latitudes, may lead to the loss of carbon from ecosystems. In particular, slash-and-burn agricultural practices in the tropics (where primary forests are cleared to make way for pastures and croplands) may lead to a substantial source of carbon to the atmosphere. In a series of keystone papers, Houghton and his colleagues estimated the changes in terrestrial carbon balance associated with historical patterns of land use and land cover change (Houghton et al. 1983; Houghton 1999, 2003). These estimates are based on national land use inventories (using historical data collected for each region, including agricultural census records reported to the United Nations Food and Agriculture Organization [FAO]) and a simple "bookkeeping" model of ecosystem carbon cycling. In Houghton's bookkeeping model, changes in land use and land cover drive changes in terrestrial carbon storage through a series of heuristic rules about how ecosystem carbon pools (including vegetation and soil) respond to land use practices. Furthermore, the carbon removed from terrestrial ecosystems (e.g., wood products, agricultural products) is tracked and allowed to decompose or oxidize back to the atmosphere on timescales ranging from 1 to 100 years. Houghton's estimates of carbon emissions from land use and land cover change have been used extensively in global budgets of anthropogenic carbon. For the 1980s Houghton estimated that land use and land cover change released roughly 2.0 PgC y-1 into the atmosphere (Houghton 1999). This result implies that there is a large sink of carbon in the terrestrial biosphere in order to make the net land-atmosphere flux balance out to only -0.2 PgC y-1. Accounting for Houghton's land use emissions estimates implies that there was a "residual" terrestrial sink of nearly -2.2 PgC y-1 during the 1980s (see Table 14.2; Prentice et al. 2001; House et al. 2003). These estimates of terrestrial carbon sources (~2 PgC y-1 from land use) and terrestrial carbon sinks (~2.2 PgC -1 accumulating in ecosystems—the so-called missing sink) have formed the foundation for our understanding of the global carbon cycle during much of the past decade. Several terms in this global carbon budget have a higher degree of certainty than others. For example, there are several different estimates of the atmospheric increase of CO2 (~3.3 PgC y-1 during the 1980s) and the fossil-fuel emissions rate (~5.4 PgC y-1 during the 1980s): These are probably the "best-known" terms in the global carbon budget. Furthermore, the partitioning of the net flux of carbon into the oceans and terrestrial biosphere is well constrained by CO2, O2, and and 813C measurements (see Appendix 14.1). In addition, the uptake of carbon by the oceans has been estimated by a number of different ocean models, which generally agree with the observation-based budget estimates (Le Quere and Metzl, Chapter 12, this volume). As a result, the most uncertain aspect of the anthropogenic global carbon budget is the breakdown of terrestrial sources (from land use) and terrestrial sinks (the so-called residual or missing sink). Until very recently, Houghton's results were the only available estimates of land use emissions. But in the past few years, a few independent estimates of this part of the carbon cycle have been put forward. One of these new estimates was produced by the Carbon Cycle Model Linkages Project (CCMLP) (McGuire et al. 2001). CCMLP aimed to evaluate the possible mechanisms behind terrestrial carbon sources and sinks, using a variety of new modeling tools and datasets (McGuire et al. 2001). In particular, CCMLP used four different process-based terrestrial ecosystem models driven by a combination of historical climate, CO2, and land use data. One of the most novel aspects of this study was the use of the newly available historical land use data from Ramankutty and Foley (1999), which presented estimates of the extent of agricultural land on a 0.5° by 0.5° gridcell (~50 km on a side) for each year from 1700 to 1992. *Using two different estimates of land use emissions—Houghton (1999) and CCMLP (see McGuire et al. 2001; Prentice et al. 2001; House et al. 2003). Note: It should be noted that CCMLP estimated carbon emissions of 0.6—1.0 PgC y-1 due to cropland changes alone. We scale this by 60 percent (the ratio of Houghton's cropland emissions to total land use emissions), to estimate a CCMLP total land use flux of 1.0—1.7 PgC y-1. Units are in PgC (1015g of carbon) per year. CCMLP exercised the model in three different ways, each considering different combinations of drivers of terrestrial carbon dynamics: (1) CO2 changes only; (2) CO2 and climate changing together; and (3) land use, CO2, and climate all changing together. These three simulations were conducted with four different models, each running from the mid-1800s to the early 1990s (McGuire et al. 2001). Considering only the emissions of CO2 from land use and land cover change during the 1980s, the CCMLP results were dramatically different from Houghton's. Houghton (1999) estimated that land use practices released approximately 2 PgC y-1 during the 1980s, whereas CCMLP (using four different models) estimated a range of land use emissions from 1.0 to 1.7 PgC y-1 (or 50 percent to 85 percent of Houghton's estimate). Using these two different estimates for land use emissions in the global carbon budget, we see that there is a major difference in the two terrestrial terms. With Houghton's land use emissions estimate, the implied "residual" terrestrial carbon sink is roughly 2.2 PgC y-1. However, using the CCMLP estimates of land use emissions, the implied "residual" sink ranges from 1.2 to 1.9 Pg C y-1 (Table 14.3; McGuire et al. 2001; Prentice et al. 2001; House et al. 2003). To date, there is no conclusive evidence for why the Houghton and CCMLP estimates of land use emissions (and the implied residual sink of terrestrial ecosystems) are so different. The differences could lie in the underlying land use data (for example, Ramankutty and Foley used the cropland area estimates from the U.N. FAO database, whereas Houghton estimated cropland changes based on other deforestation statistics) or in the way that carbon flows through ecosystems were simulated (Houghton used a bookkeeping model for several large regions of the world, whereas McGuire et al. used four process-based ecosystem models on each 0.5° by 0.5° gridcell of the world). These two groups are currently working together to understand the differences in the two estimates and how they can be reconciled in the future (e.g., House et al. 2003). Two other recent studies (Archard et al. 2002; DeFries et al. 2002) also call into question the original land use emissions estimates of Houghton. DeFries et al. estimated that land use emissions were ~0.6 (±0.3-0.8) PgC y-1 in the 1980s (compared with Houghton's estimate of 2 billion tons per year), and ~0.9 (±0.5-1.4) PgC y-1 in the 1990s (compared with Houghton's estimate of 2.2 billion tons per year). A similar estimate was produced by Archard et al., who suggested land use emissions were 1.0 (±0.2) PgC y-1 during the 1990s. Although the CCMLP, DeFries et al., and Archard et al. estimates all seem to point to significantly lower land use emissions than Houghton, it is still unclear which estimate is the most accurate. At this point, it is most important to recognize this: We may have constrained the overall net flux of carbon between terrestrial ecosystems and the atmosphere (using atmospheric measurements of CO2, O2, and 13C; see Prentice et al. 2001), but the breakdown between terrestrial carbon sources (from land use) and terrestrial carbon sinks is still highly uncertain—and possibly in error by a factor of two.